Cold plasma is otherwise referred to as the 4th state of matter. When you apply enough energy to a gas a plasma discharge can be achieved. It is estimated that 99% of the known universe is in a plasma state. The sun and stars are examples of natural plasmas. 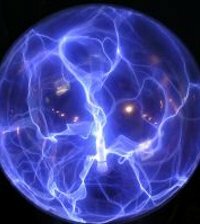 Man-made plasma can be generated at low temperatures typically by applying a voltage to a gas. The electric field generated from the applied voltage can accelerate any free electrons in the gas. Accelerated electrons collide with gas atoms to excite or ionise them. Ionisation of gas atoms releases more electrons; this cascaded reaction can generate a rich abundance of highly reactive chemical species which are capable of inactivating a wide range of microorganisms including food borne pathogens and spoilage organisms. The diffuse reactive species revert back to an inert gas atom once the applied voltage is removed. Cold plasma is not yet realised for the food industry but this technology offers potential applications that could have significant benefits. The most noticeable application is the disinfection of surfaces in particular equipment, packaging, food contact surfaces or even food itself. Compatibility with food products could allow shelf-life extension or online disinfection of processing equipment to reduce cross-contamination and the establishment of biofilms on equipment. Plasma treatment requires no liquids making this technology an ideal disinfection tool for manufacturers of low water activity products. Campden BRI currently has a Cold plasma system on loan from Liverpool University which is available for research and private contracts. A feasibility study using this technology for surface disinfection is being conducted as a part of the Member funded project New technologies for food manufacturing (2013-2015). Click here to find out more information about this and the many other member funded research projects happening at Campden BRI.